I have been camping this week. It rained all one day, so I sewed by hand. I got started on my Red Hexagon flowers. I got a few crazy red prints. I got a few more Blue Turquoise flowers done last month but forgot to show them off. I also had some Yellow ones I got done last month. Here is about 6 weeks of Hexie flowers all together. I have been sorting my red. I got a few spool blocks done. 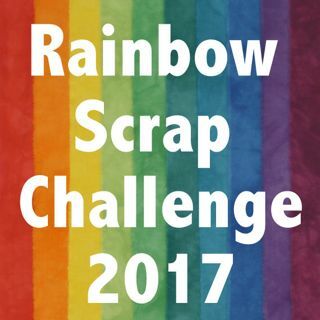 I have linked up with Soscrappy. So when travelling we had to go to a few quilt shops too. We made a stop in Windfield, were I got the light dots, pink and dark blue dots. I got the Red and light blue dots in Rockymountain House at the shop in town. I have plans to use the light dots (2m) for some Rainbow scrap challenge project next year. We will have to start looking for more to do. I love the flowers! Maybe I should get my own hexie project out again! The Hexies are going to make one YUMMY quilt. I love that you are making each petal and center a different print! Genius! I like how you used a variety of one colour in each hexie. I'm just packing up for a two week road trip with camping every night -- here's hoping for great weather! 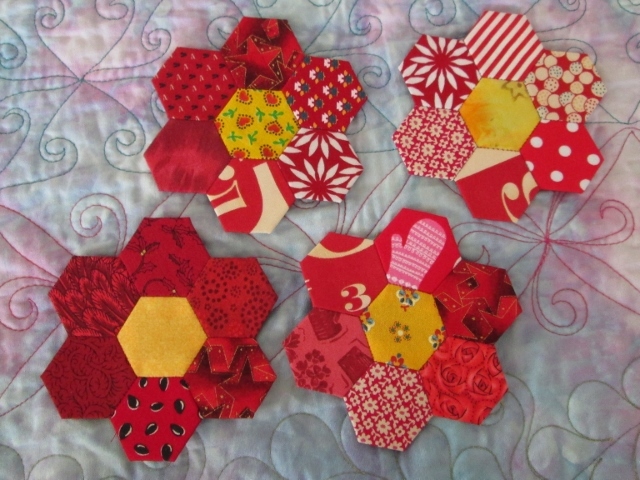 You found the perfect way to spend a rainy day - your hexies are very sweet! Your hexie flowers are so pretty. Just like a summer garden. I love your hexies and spools. 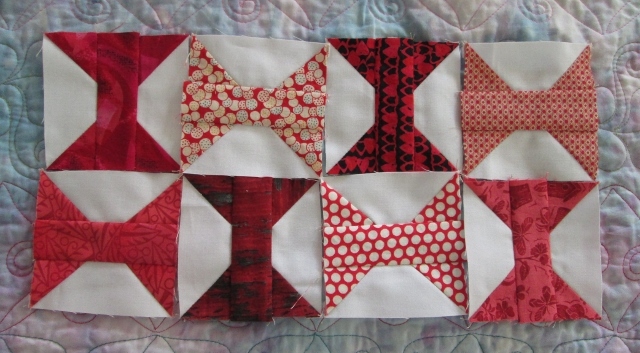 They are going to be awesome quilts. So many colorful fabrics! 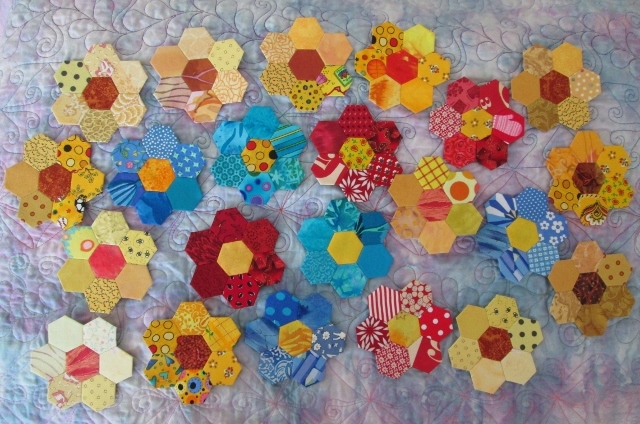 Fun hexie collection. It is always so nice to find some quiet hand stitching time. 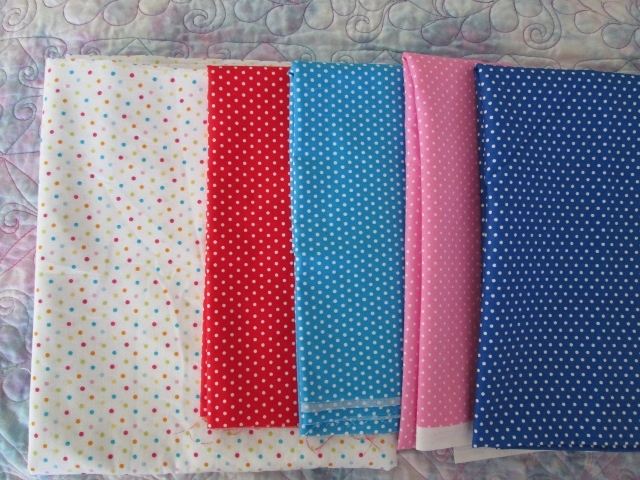 Love the polka dots fabric. Glad you are already making plans for next year. Those hexies are so cute. I love the yellow centers. I'm working on spools too. I love watching your flower garden grow! The red flowers are so pretty with the yellow centers. Pretty spool blocks too. 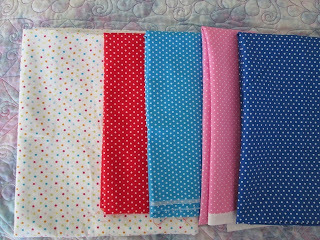 I have some of the light dot fabric too! I think mine has a more pastel feel - I was thinking it would go well with baby colors. I love your hexagon flowers! They are so pretty. I am finally starting to put together my hexagon flowers...years of work! 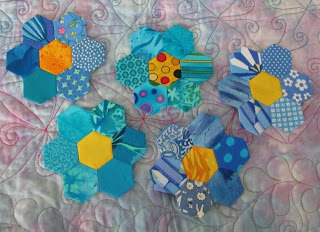 Those flowers are so pretty -- I have GOT to learn to do hexagons!